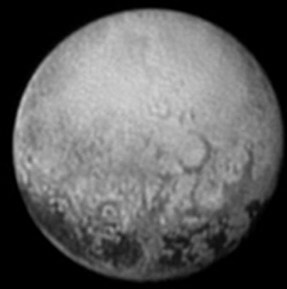 New Horizons hasn’t even arrived yet, but we’re already saying goodbye to Pluto’s far side. According to principal investigator Alan Stern, this is the last, best look anyone will have of Pluto’s far side for decades to come. The far side of Pluto. Credit: NASA/Johns Hopkins University Applied Physics Laboratory/Southwest Research Institute. The photo looks like an artist’s impression of Pluto, not what I imagined the real thing to be. At least it’s better than the first official photo of the far side of our moon, taken by Luna 3 in 1959. This side of Pluto that always faces Charon, and New Horizons will whip past the other side of Pluto in a few days time. By the time that New Horizons sees the far side of Pluto again, the probe will be on its way out of our solar system. ← Space news #24: Philae is awake!